I love everything about summer dinners. Eating outdoors, using herbs from the garden, farmer’s market veggies and grilling. I enjoy entertaining during the summer. Everything is simple but fresh and very relaxed. We had friends over for dinner last weekend and I was able to spend the evening chatting rather than rushing around in the kitchen. The appetizer and side dish were made a head of time and the main and vegetable were done on the grill. It doesn’t get better than that! 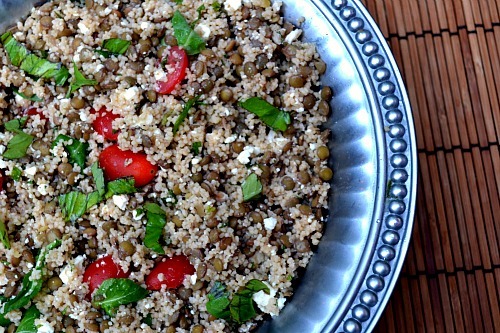 While looking for side dishes that could be prepared ahead of time, I came across this Mediterranean Lentil and Couscous Salad. First, I have a serious fondness for anything that involves Mediterranean flavors and liked that that base of the salad was lentils and couscous. The inclusion of tomatoes, feta, arugula and fresh herbs really made this stand out. Second, I have an appreciation for recipes from Gourmet and usually find them to be winners. I let the salad sit overnight to really let the flavors develop. It was a hit with our guests and the perfect side for a summer cookout. I enjoyed the leftovers for lunch the next few days! Place lentils in a small saucepan and cover with 2 inches of water. Bring to a simmer and cook for 15-20 minutes or until lentils are tender but not falling apart. Drain and transfer to a bowl. Stir in one tablespoon vinegar and salt and pepper to taste. Cool lentils completely. In a saucepan, bring water to a boil and add couscous and salt. Remove from heat and let couscous stand, covered, 5 minutes. Fluff couscous with a fork and transfer to a large bowl. Stir in 1 tablespoon oil and cool completely. In a small bowl, whisk together garlic paste, remaining 2 tablespoons vinegar, remaining 3 tablespoons oil and salt and pepper to taste. Stir lentils and dressing into couscous. Chill salad, covered, at least 3 hours and up to 24. Just before serving, stir in remaining ingredients, top with basil and season with salt and pepper. At this time I also added another drizzle of olive oil and a splash of vinegar but that’s totally optional. 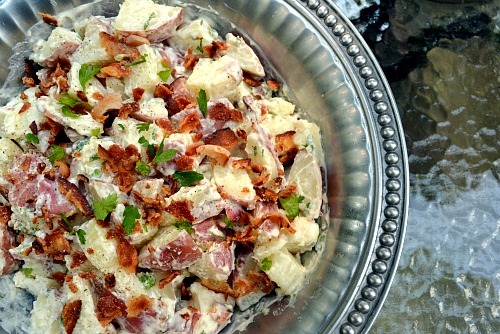 My parents make great traditional potato salad. You know, the mayonnaise-based kind that includes celery, onion and hard boiled eggs. I’ve tried to recreate it a few times but it never tastes as good as it does when they make it and I really don’t love old school potato salad unless it’s that recipe. So instead of trying to master their version, I like to try different variations of potato salad. We attended a family cookout for Memorial Day last night and I volunteered to bring Feta Potato Salad. 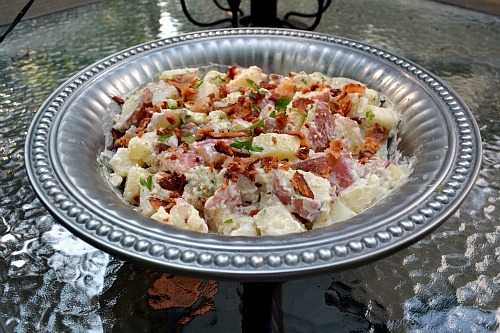 I was in the process of making my grocery list when this recipe for Bacon Ranch Potato Salad popped up in my Google Reader. I immediately abandoned plans to make a tried and true recipe in favor of trying something new (not that the feta potato salad isn’t amazing…you must try!). I knew my audience and Bacon Ranch Potato Salad sounded right up their alley…especially with a large number of kids in attendance. This recipe is relatively simple with boiled potatoes being tossed in homemade ranch dressing and crumbled bacon. Actually, my favorite thing about this recipe was that the ranch dressing was homemade with a short ingredient list of things that are usually in my kitchen. I would make just the ranch dressing part of this recipe for salads. It was delicious! This new twist on potato salad was a hit with my family and is sure to be a winner at any summer cookout! Place potatoes in a large pot and cover with 1-2 inches of cold water and 1 tablespoon of salt. Bring potatoes to a boil and cook until just tender, about 10 minutes. While potatoes are cooking, whisk together mayonnaise, sour cream, herbs, green onion, garlic, lemon and buttermilk in a bowl. Season to taste with salt and pepper. Drain potatoes and transfer to a serving bowl. Let stand for about 10 minutes and then pour half of the ranch dressing over the potatoes and half of the crumbled bacon and gently toss to combine. Refrigerate one hour and then toss with remaining ranch dressing. Top with the rest of the crumbled bacon and garnish with chopped parsley. Return to refrigerator until ready to serve. My dad made this dressing recipe from Cuisine at Home several years ago and it’s been a family staple ever since. There is nothing fancy about this dressing and the ingredients list is surprisingly short but it sure is good – especially topped with gravy! My grandmother has always been the dressing maker for our family Thankgsivings but even she got on board with this recipe. If you’re looking for a classic, traditional dressing recipe, this one’s for you! Preheat oven to 375 degrees and coat a 2-quart casserole dish with nonstick cooking spray. 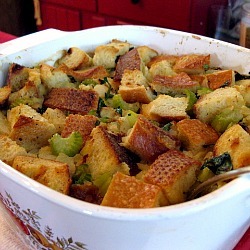 Place casserole dish on a foil-lined baking sheet and set aside. Soak bread in milk while you prepare other ingredients. Melt butter over medium heat in a large skillet. Add onions and celery and cook 6-8 minutes, stirring frequently, until soft. Stir broth, onion mixture and herbs into bread and then add eggs, salt and pepper and gently stir until incorporated. Pour into prepared baking dish and bake for one hour or until center is set. Let’s get to the food. I have another holiday recipe for you! 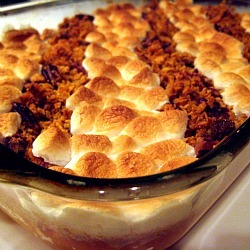 I discovered this sweet potato casserole several years ago when Brandon requested a marshmallow-topped casserole and I wanted something a little different. This recipe was the perfect compromise and with the alternating layers of pecans and cornflakes and marshmallows, you can be sure that everyone at the table will be pleased. Also, I love the presentation of this casserole. It’s a pretty addition to a holiday spread. I will be posting a Thanksgiving recipe round up tomorrow so stay tuned! Preaheat oven to 400 degrees. Pierce sweet potatoes with a fork and bake for one hour, or until tender. Let cool and then peel. Reduce oven temperature to 350 degrees. Using a stand mixer fitted with the paddle attachment or a handheld mixer, beat sweet potatoes, sugar and next 5 at medium speed until smooth. Spoon potato mixture into a greased 11- x 7-inch baking dish. Combine cornflakes cereal, 1 tablespoon of melted butter, pecans and brown sugar in a small bowl. Sprinkle diagonally over casserole in rows (do not add the marshmallows yet!). Bake for 30 minutes. Remove from oven; let stand 10 minutes. Sprinkle alternate rows with marshmallows; bake 10 additional minutes. Let stand 10 minutes before serving. Get ready for my first Thanksgiving recipe post! I will be sharing Thanksgiving recipes here and there from now until Turkey Day. I actually made this side dish last year because I wanted to introduce some more inventive recipes to the traditional spread. I was browsing through Epicurious’ top-rated Thanksgiving recipes and found this recipe for Brussels Sprout Hash with Caramelized Shallots from Bon Appetit. The preparation is a little different than your traditional brussels sprouts recipe. Instead of cooking them whole or halved, you cut them into shreds. I like this because they seem more cabbage-like and visually help those who aren’t so sure about brussels sprouts. The caramelized shallots add so much to this dish and the apple cider really brightens the overall flavor. I don’t really understand how brussels sprouts got such a bad rap? I was interested in how they’d be received by my family. (Please note that I wrote this post after I made the dish last year. It’s been waiting a whole year to be published!) The verdict? My mom claims she’s still not a fan (oh well). My grandmother, who is a cabbage lover but never liked brussels sprouts because she had only ever tried the frozen ones, decided that she is a fan. My dad and I, who’ve always liked them, enjoyed this recipe. Everyone at the table at least gave them a try so that’s all I could ask. 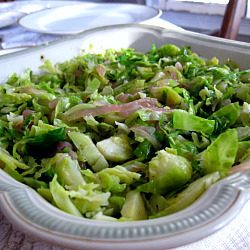 If you are a brussels sprouts love this is a great preparation variation to try. Melt 3 tablespoons butter in medium skillet over medium heat. Add shallots; and sprinkle with kosher salt and pepper. Sauté until soft and golden, about 10 minutes, stirring frequently. Add vinegar and sugar. Stir until brown and glazed, about 3 minutes. Cut brussels sprouts in half lengthwise. Cut lengthwise into thin (1/8-inch) slices. Heat oil in large skillet over medium high heat. Add sprouts and sprinkle with salt and pepper. Cook until brown at edges, about 6 minutes. Add 1 cup water and 3 tablespoons butter. Sauté until most of water evaporates and sprouts are tender but still bright green, about 3 more minutes. Add shallots and mix to combine. I came across this recipe in the August issue of Cuisine at Home and immediately added it to the following week’s dinner menu. I had a variety of cherry tomatoes from my brother in law’s garden and basil growing in my herb garden. A perfect combination! These were extremely easy to put together and created a pretty impressive side dish. The flavor was fabulous – what’s not to love about homegrown tomatoes, goat cheese and basil? I went on and on to Brandon at dinner that these would be the perfect thing to make for dinner guests. 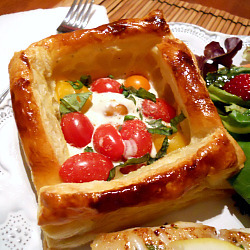 I also think you could cut the puff pastry a bit smaller for an impressive appetizer. I served my tarts with sautéed grouper and a salad but these could easily be a meatless main course alongside a big salad. Thaw puff pastry according to package directions. Preheat oven to 400 degrees. Cut one puff pastry sheet into four even squares. Place squares on a parchment lined baking sheet. Cut remaining sheet into eight strips about 3/4 inch wide and then cut the strips in half crosswise (to create 16 total). 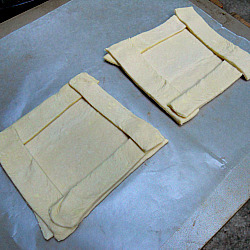 Place four strips around the edge of each pastry square, overlapping the corners (see photo above). Lightly brush edges with egg mixture and bake until puffed and brown, 22-24 minutes. Whisk together goat cheese and milk. Divide cheese mixture among centers of baked tarts, spreading with a spatula and pressing very lightly to slightly deflate the centers. Top cheese mixture with tomatoes and season with salt and pepper. Return tarts to oven and bake another 5 minutes. Garnish with fresh basil and serve warm or at room temperature. I decided to go all out and top them with pimento cheese. 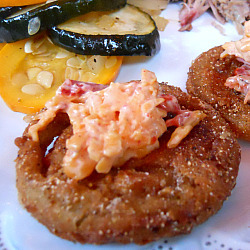 Fried green tomatoes topped with pimento cheese were one of the passed hors d’oeuvres at our wedding and were a huge hit. I was really surprised by how easy these were to make. I fried them in my cast iron skillet. It was relatively painless and didn’t leave the house smelling “fried.” I was very pleased with the final result – the tomatoes were perfectly crispy on the outside and had a great texture on the inside. The pimento cheese topping really took them up another notch! I admit that I am planning on making these again soon for fried green tomato BLT’s and I can’t wait! Take advantage of tomato season and give these a try! Place sliced tomatoes in colander. Salt lightly, and let sit for about 5 minutes to help draw out moisture. Rinse under cool water and pat dry with paper towels. Prepare wash by mixing buttermilk and eggs. Prepare dredge by mixing flour, cornmeal, onion powder, garlic powder, salt and pepper. Working one at a time, completely coat each tomato slice in the wash and then in the dredge, gently shaking off excess. In a cast-iron skillet over high heat, bring butter and canola oil to 350 degrees (use a candy thermometer). Reduce heat to stabilize. Working a few slices at a time, fry the tomatoes until golden brown, turning only once (about 3 to 4 minutes total). Transfer each batch to drain on brown paper bags or paper towels. Mix together cheese, mayo, pimentos, cayenne, salt, pepper and garlic powder if using. Stir together and refrigerate until ready to serve.